NOW: Jean Sherrard photographed his repeat from the second floor of Monty West’s home on West Commodore Way. Before it was hauled away Monty’s stump was behind Jean in the back yard, up the hill and near the family swimming pool. This Sunday afternoon, March 10, the Magnolia Historical Society celebrates its tenth anniversary with what it expects to be an “entertaining and informative” open meeting. Those who attend will reflect together on Magnolia’s history, sharing a heritage that includes this tall landmark stump. Society member Monty Holmes is confident that Kiehl’s sawyer-made platform was once his. The alert 82-year old Magnolian was born and raised on the Magnolia side of the Chittenden Locks. During the Great Depression, for ten cents a bottle young Monty sold fresh milk got from the family’s cows to the WPA (Works Progress Administration) workers who with shovels and wheelbarrows made a graded West Commodore Way out of what the locals still often chose to call West Cow Manure Way. Come if you can between 2 and 4 this afternoon to Our Lady of Fatima Parish at 3218 w. Barrett Street. 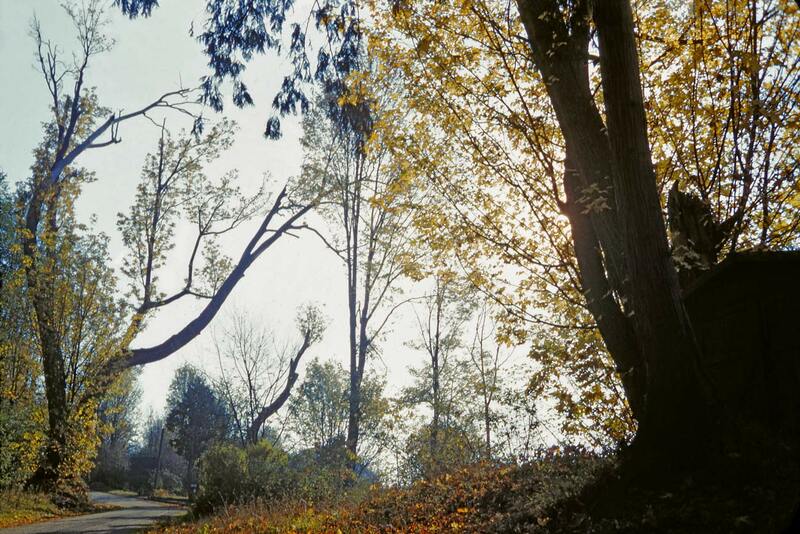 It is in Magnolia’s verdant Pleasant Valley, which was once a green pasture for the neighborhood’s dairy farms. Monica will be there, of course, Monty will be there too, and Jean and I as well. Among other subjects we will be reviewing Monty’s stump story. He is quite confident about it all, but we still cannot resist the fun of a silly pun. We are, we confess, for the moment stumped by the stump. Dear Blog Readers and Watchers. Jean and I are expecting the arrival from Paris of the third namesake for this blog, Berangere Lomont. We have all done our part to load the new exhibit at MOHAI (The Museum of History and Industry) with stimulating examples of repeat photography. We have a quartet of subjects. Playing violin is Berangere. Like herself her examples are all from Paris, the birthplace of photography. I’m on viola, all tremulo with examples from Seattle, all of them pulled from features done for The Seattle Times over the past nearly 30 years. This time, however, Jean does all the “nows.” Jean holds the cello both in life as he plays it – he is a indeed a cellist – but also in this running analogy. At MOHAI he introduces the Washington State part of it all. Most of those subjects are taken from his and my book “Washington Then and Now.” For the Basso Continuo, we have wired it with Wallingford examples and it will play on its own. Here the repeats were recorded on a daily basis for time-lapses. I covered over 400 subjects through more than three years of walking the neighborhood, but of these we will for now only fashion about twenty examples with a time-lapse that may run as long as 45 minutes. Ron Edge and I are still working on it and so this week I have skimped some on the blog in order to give the MOHAI show more time. It opens on Saturday the 8th and will be up into 2012. Please pay it a visit. May I make note that there are many Magnolia subjects already up on this blog. They can be easily searched for with the search box, upper-right. Simply write in “Magnolia” and its cup will run over like Pleasant Valley springs – those that have not been directed into the storm sewers. 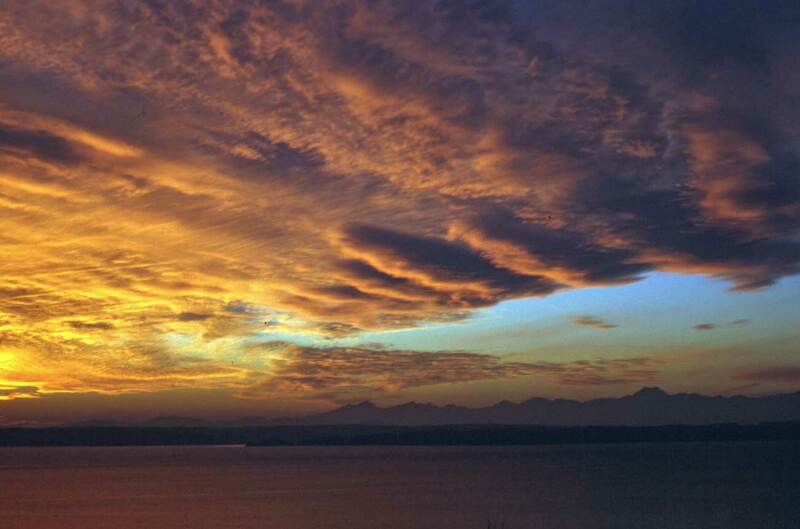 1881 was a brilliant year for electricity in Seattle. 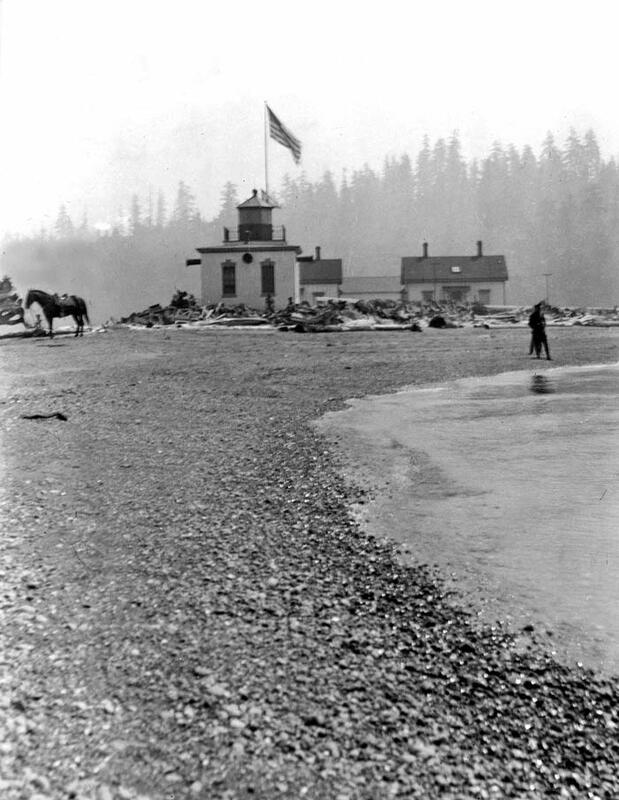 On the night of July 31, the steamship Willamette burned four lamps or three hours “for the edification of the public.” Pioneer chronicler Thomas Prosch was among the crowd that “turned out en-masse to see and admire” the first electric lights shown here. 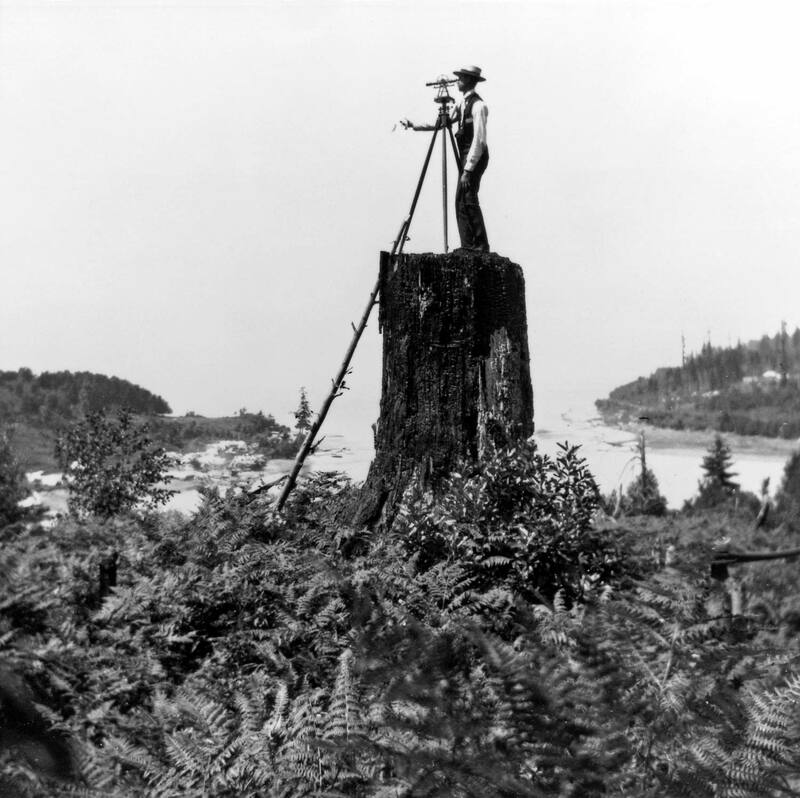 The first telephone franchise in Seattle was also awarded in 1881. 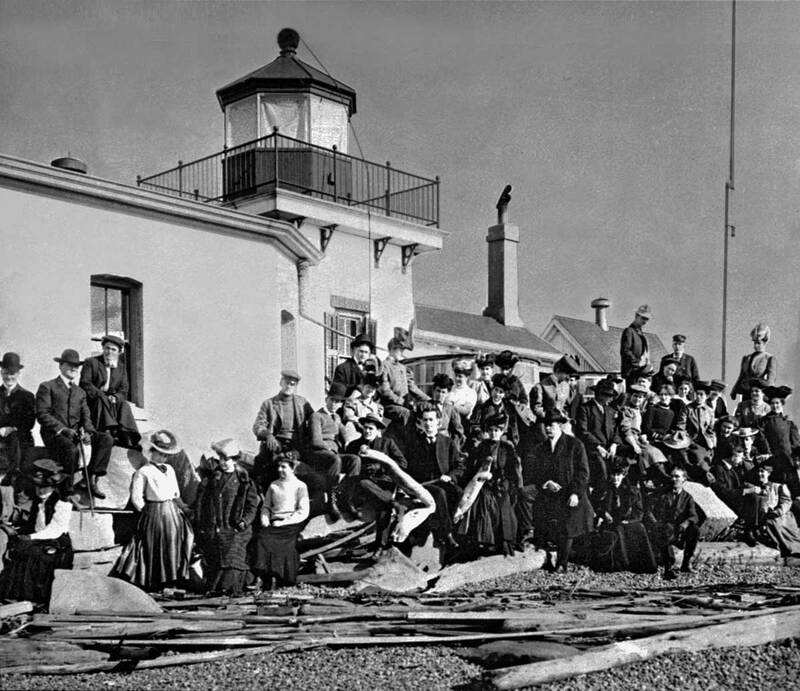 And for all “ye ships at sea” this year, 1881, the mysterious powers of the French-made Fresnel lens were released from the then new Magnolia’s West Point Lighthouse. 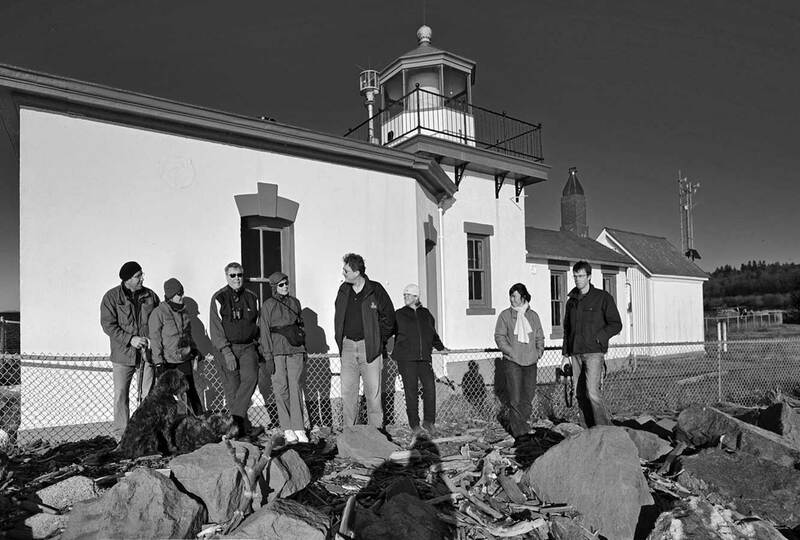 At its centennial in 1981, lighthouse historian Jim Gibbs figured that the light’s 12 bulls-eye optics had by then scanned the night with its characteristic two pulses of light – one red and one white – with five second pauses between them for about 395,000 hours. 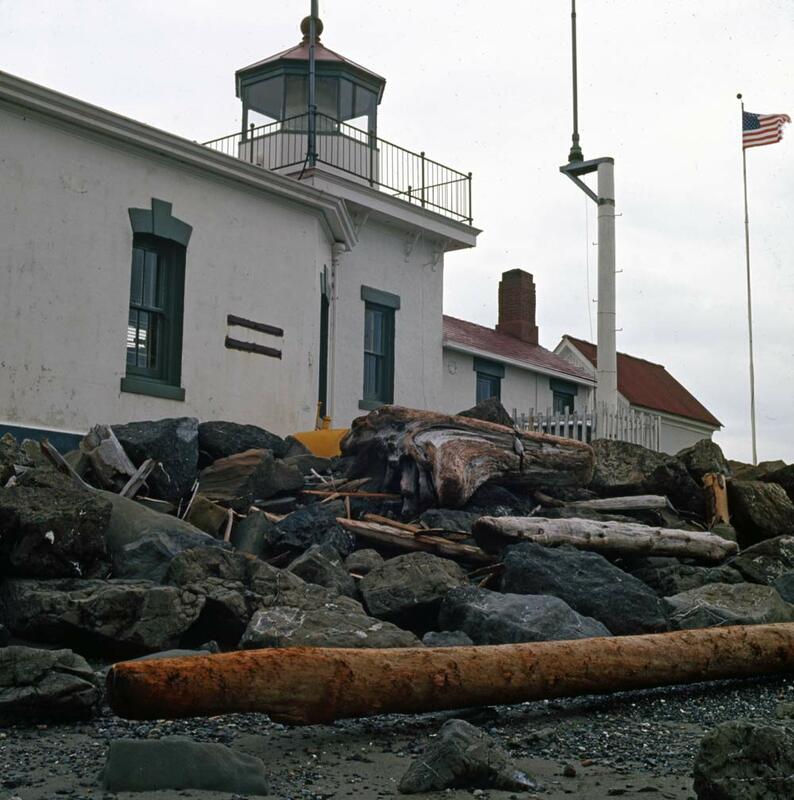 Here a quarter-century old West Point Light sets the stage for the founding members of the Seattle Mountaineers. They pose on their first outing, which was timed for the tides. This 1907 group portrait appears on page 324 of the new book “Magnolia: Making More Memories,” which also features the lighthouse on the cover. Inside is Monica Wooton’s illuminating history of the lighthouse accompanied by many more photographs. Above and below, early views of the West Point Light. 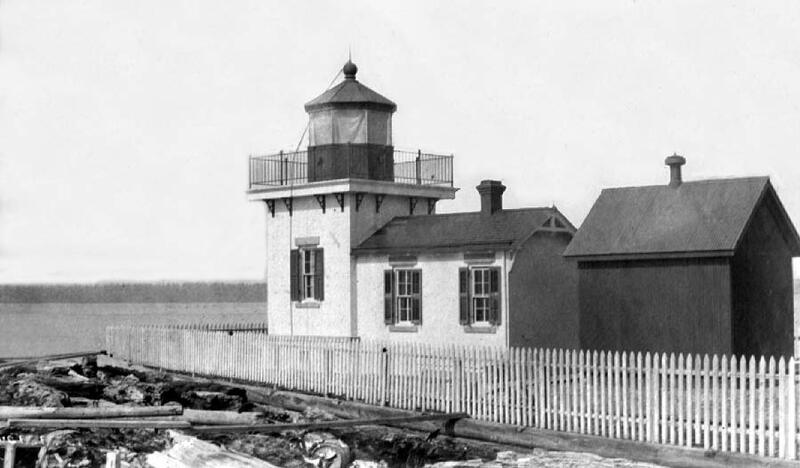 West Point Light circa 1916. Frank Shaw's slide of the light ca. 1970. Here the "world class" athlete is not holding the pose but the brush. 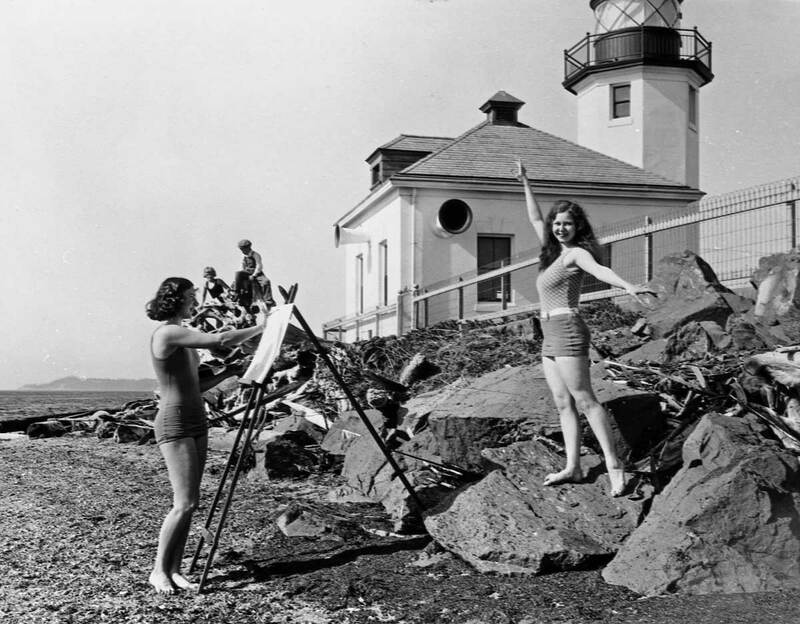 Seattle swimmer Helene Madison may actually be painting the joyful creature on the rocks, although it is hard to hold one's arms so for long. Helene Madison (1913-1970) learned to swim in Green Lake and went on to break 117 US. and world freestyle swimming records when still in her teens. In 1932 she won three gold medals at the Olympic Games in Los Angeles. Two local pools are named for her, one in the Washington Athletic Club and the other on Meridian Avenue North. We don't know the name of Madison's model, although it may be recorded. This scene was, I believe, created for The Post-Intelligencer. 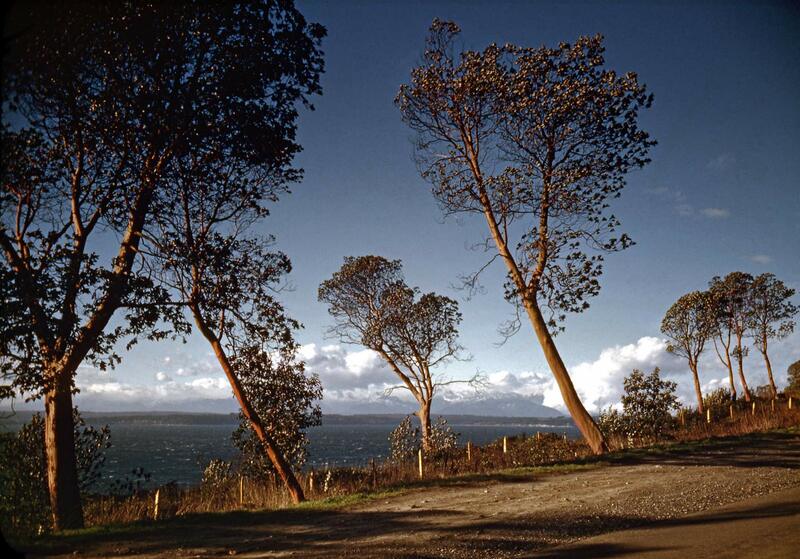 The Magnolia neighborhood is represented by the Madrones that lean from its bluff towards Puget Sound. 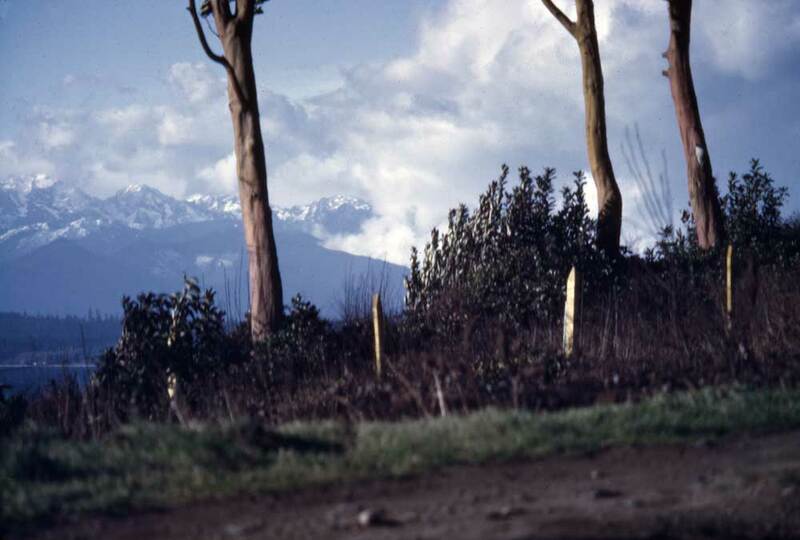 We will include a few examples of slides taken by Horace Sykes, a Magnolia resident on Bertona until his death in 1954, and Robert Bradley who easily reached the neighborhood from his home on Queen Anne Hill. 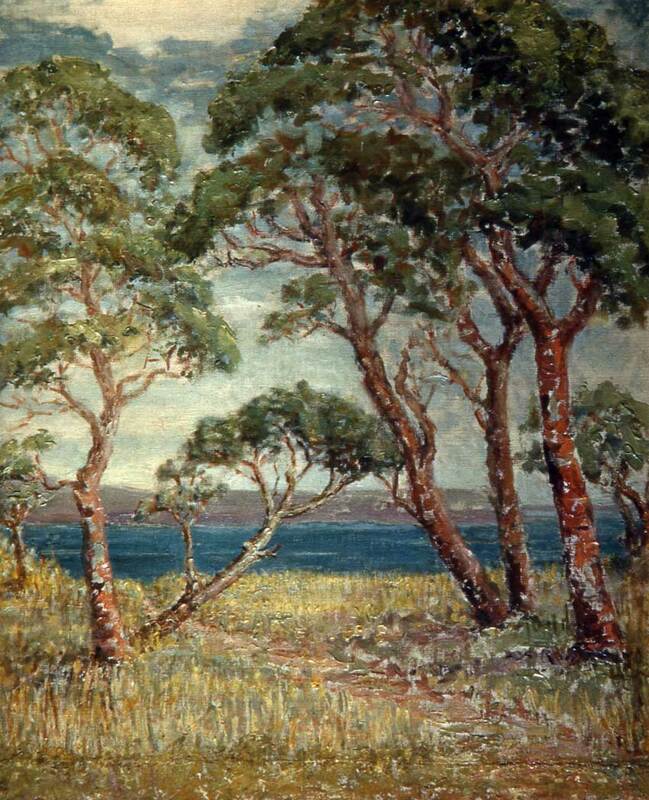 The painting below – or a slide of it – is part of the Horace Sykes collection. It may well hang somewhere in Seattle. 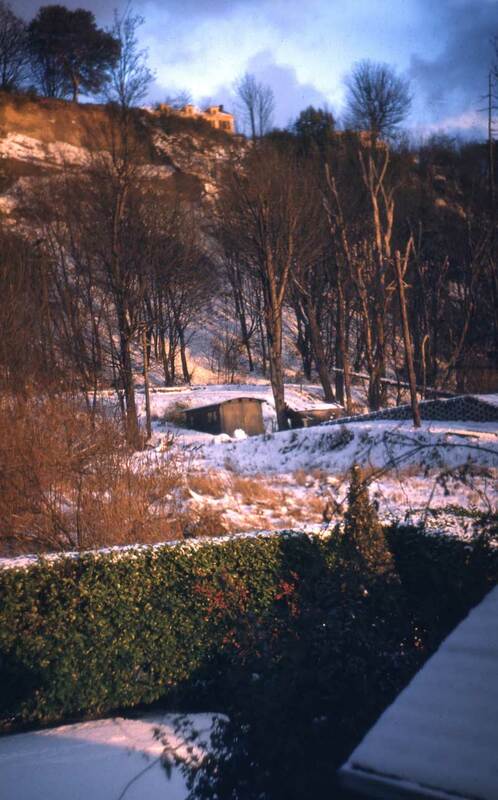 The slide below looks up from the rear of the Sykes home on – or near – Perkins Lane. 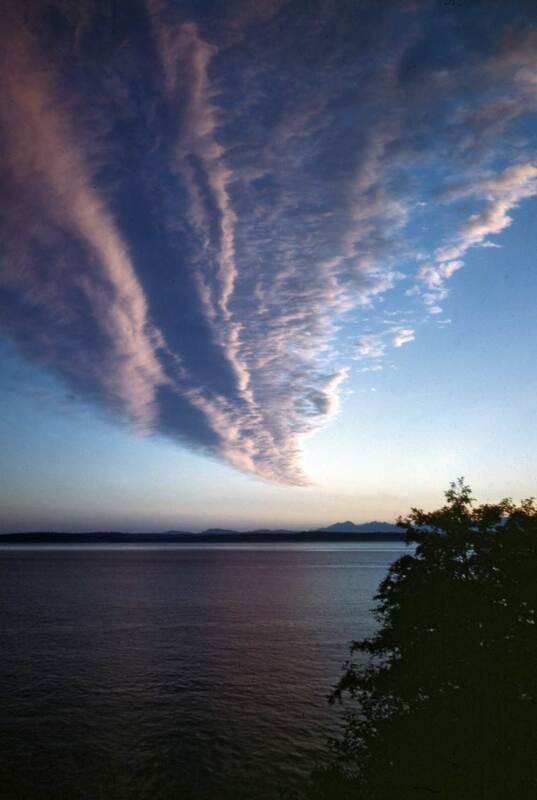 Living a few feet above Puget Sound, Sykes used his prospect to photograph many outstanding clouds and sunsets. Bradley also paid attention to the light show to the west, and here he dates it as well - January 20, 1963. Although I have not explored Perkins Lane to fulfill or dissapate my hunch, this may have been taken along that often picturesque drive. This, I believe, is a rare piece of Interbay ephemera. 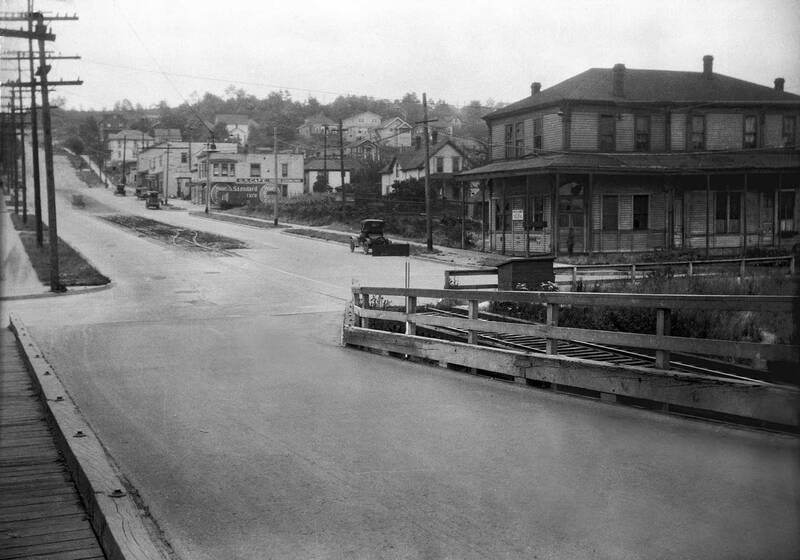 The scene looks west on Dravus Street with the photographer standing on the bridge that crossed above the railroads yards. The G. N. (for Great Northern) Cafe is right-of-center. I know of no photographs of the neighborhood that are earlier than these two. 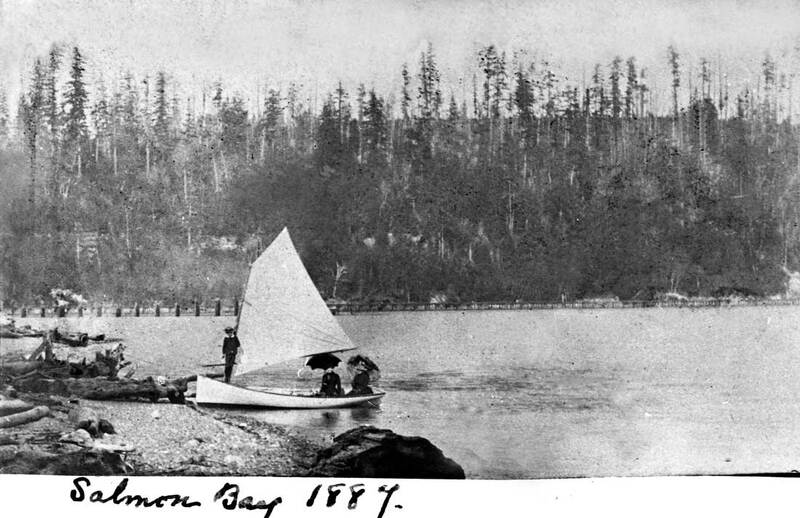 One from Shilshole Bay – shown first – is dated 1887, and the other most likely from Interbay is very possibly also from that year. Both are copied from the Lowman album, compliments of collector-dealer Michael Maslan. 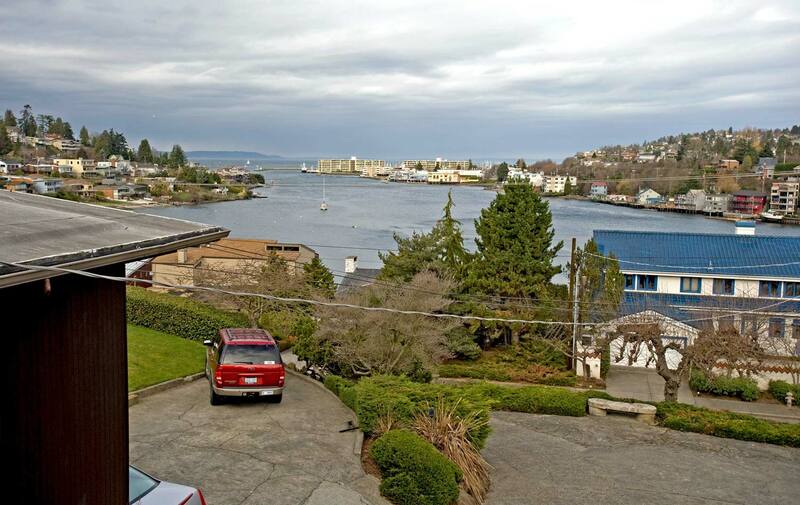 The caption for this view was written long before the Lake Washington Ship Canal's Chittenden locks separated Shilshole Bay from Salmon Bay. 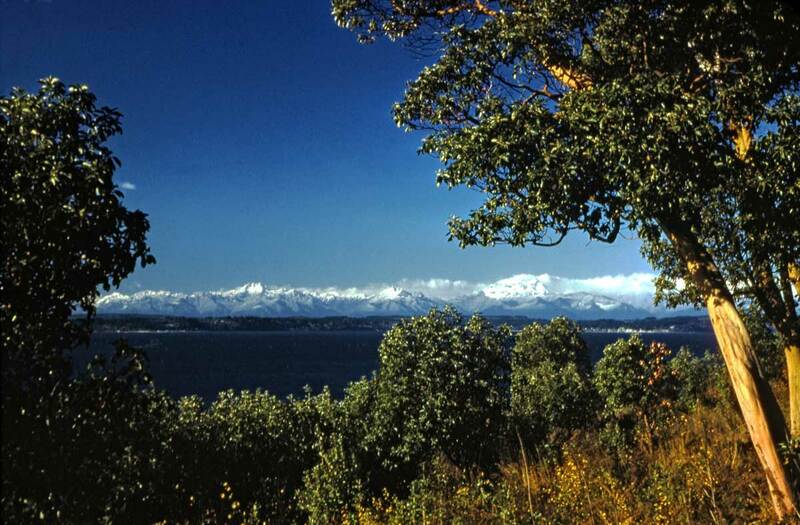 I think this looks south towards Magnolia across what we now call Shilshole Bay. The entrance to the locks and old Salmon Bay is around to the left. Another reader may wish to identify the land beyond as part of Queen Anne. Another look south towards Magnolia, with imposed captions that give the date, March 14, 1930, point out West Point, and indicate a problem for which the photograph is perhaps evidence. The old Lowman family album that includes this panoramic print captions it simply as “Smith Cove.” I believe that and more. On the evidence of other similar prints from the same album that are captioned and sometimes dated by the same hand we may adopt a date for this bucolic scene:1887. 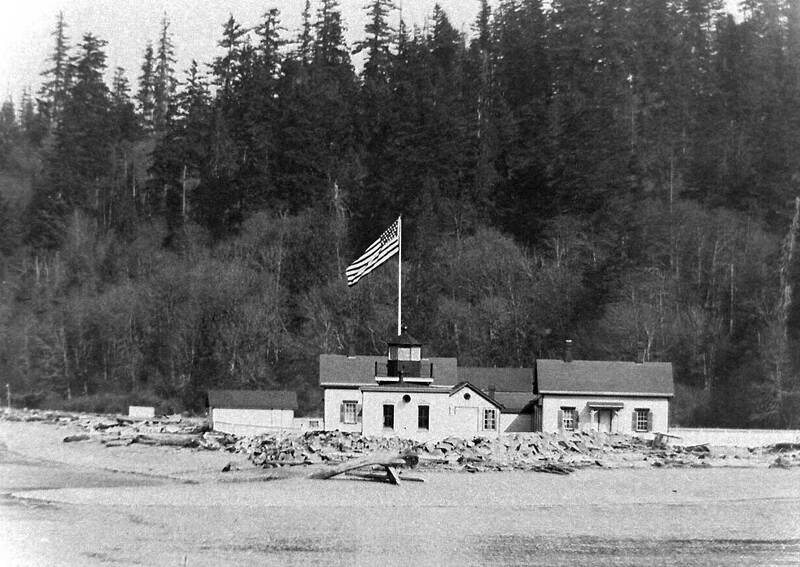 It is a likely year, for it was in the summer of 1887 that the three-mile long off-shore trestle of the Seattle Lake Shore and Eastern Railroad reached the low land between the hills of Queen Anne and Magnolia and the tides of Elliott and Salmon bays. The photographer may have taken an excursion to the previously remote Smith Cove aboard a S.L.S.E.R. car. Perhaps it was James Lowman himself. As Henry Yesler’s nephew and by 1886 the manager of his uncle’s affairs he could have easily arranged a ride. Both Henry Yesler and Henry Smith arrived in Seattle in 1852. The former built his mill and the latter settled at Interbay with the savvy premonition that one day railroads would roll through it. Following the S.L.S.E.R. in ‘87, the electric interurban to Ballard came in 1890 and the Great Northern Railroad in 1893. We may never know if these are Smith’s sheep or exactly where this Interbay scene was photographed. It probably looks west towards the somewhat gentler Magnolia incline. 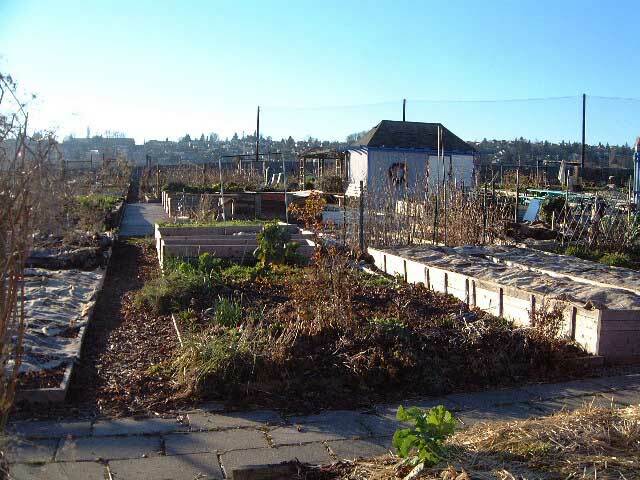 For the “now” repeat I chose the Interbay P-Patch, although it is much further to the east than was Lowman’s position. 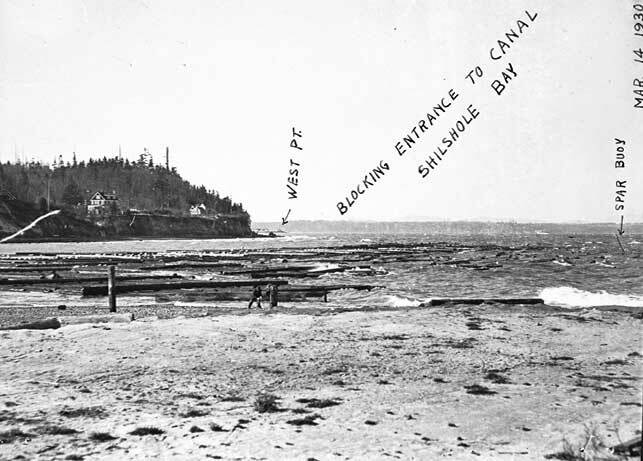 Before Interbay was filled in the early 20th Century the highest tides on Elliott Bay reached as far north as Haliday Street now near the center of the golf course that has been developed on reclaimed land. 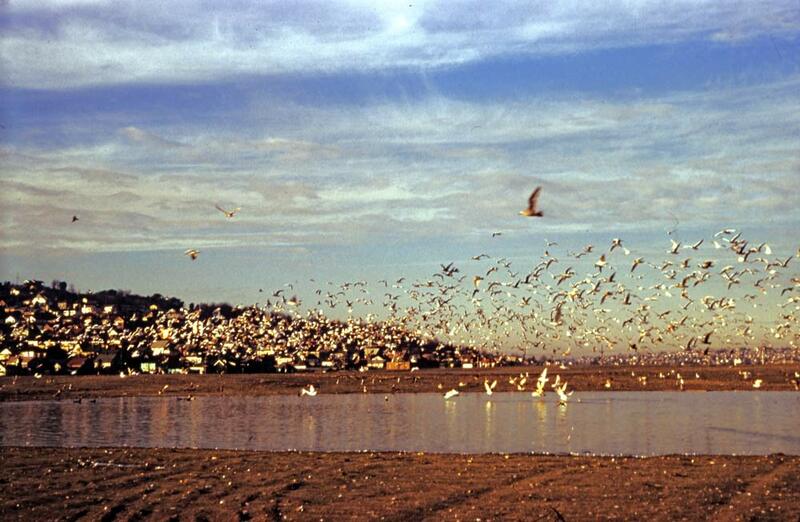 Today golfers play well above the highest tide on a landfill that before it was properly capped regularly wrapped swooning handicappers in sightless and odorless clouds of the methane gas generated by decades of dumped garbage. The scavengers of Interbay by Robert Bradley. Before returning to the remaining work needed for a kind of polish on the Wallingford Time-lapses I’ll insert a maritime scene at Smith Cove that is one of my favorites of those photographs I have used while doing this feature for the past few years. The consistently delicate setting of this maritime scene – how the afternoon light shapes the vessels and scatters upon the water – is also monumental by reason of its largest subject, the steamship Dakota. On the heals of its sister ship the Minnesota, the Dakota was built in 1903 in Connecticut for the steamship arm of the Great Northern Railway and brought around the horn to its home port between the railroad’s long piers at Smiths Cove. It began its first round to Yokohama, Japan in September1905. The two 20,000-plus ton cargo-passenger steel-hulled steamers were then by far the largest vessels on the Pacific Ocean. Eleven decks high they could hold the equivalent of 107 freight trains of 35 cars each, and in fact on its first voyage the Dakota delivered more than one locomotive to the railways of Japan. It also carried 600 sacks of mail, and the passenger list was full. In the McCurdy Marine History of the Pacific Northwest the ship’s ornate staterooms are described as spacious and plush. 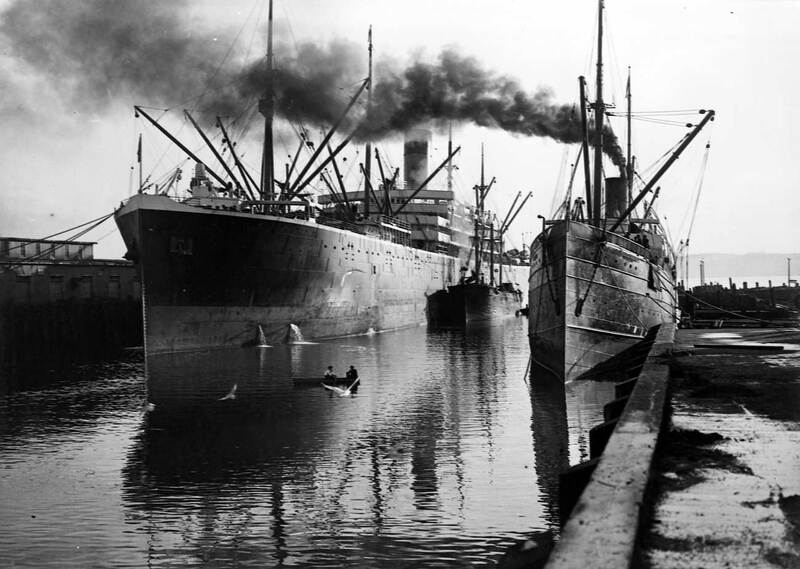 At the time Clarence R. Langstaff, a carpenter and long-time resident of the Magnolia neighborhood, recorded this exquisite view either in late 1905 or 1906 the steel-hulled Oregon, on the right, was the oldest passenger vessel on the West Coast. Built in Chester, Pennsylvania in 1878, the 283-foot steamer was soon operating on a regular route between Portland and San Francisco. By the time she appears here the steel plating in her bilge had been repaired so with cement that the Oregon was described as running on a “stone bottom.” But she was still fast, holding the Seattle to Nome record. Something beside this Smith Cove slip and the trail of smoke ties these vessels – a fate that followed not long after Langstaff visited them. At midnight on the thirteenth of September while heading for Nome, Alaska Capt. Horace E. Soule ran the Oregon onto an uncharted rock near the entrance to Prince William Sound. On a clear and bright afternoon the following March third, Captain Emil Francke drove the Dakota onto a well-charted reef about 40 miles south Yokohama. Although the big ship was underpowered running at best only 14 knots per hour its inertia was considerable and the reef sliced through about a third of the Dakota’s 622 feet. In both mishaps all lives were saved but not the ships, most of the cargo, or Capt. Francke’s job. While Soule was not held at fault Francke had his license removed and wound up working as a watchman on the San Francisco waterfront. Many photographs survive of the short-lived Great Northern Steamer Dakota’s berthing at Smith Cove, but pictorially Clarence R. Langstaff’s is perhaps the best of the lot. Other Langstaff are preserved by the Museum of History and Industry. Courtesy of Russell O. Langstaff. A Magnolia home brightened in the 1950s by Skagit Power.